I saw a coworker futzing around with an Astrotrain bootleg toy today. You know — Astrotrain. The Transformer that turns into a train and a space shuttle. And also a robot. It didn’t look exactly like the one below, because it was a bootleg and apparently this photo is of a prototype, but I recognized it immediately. 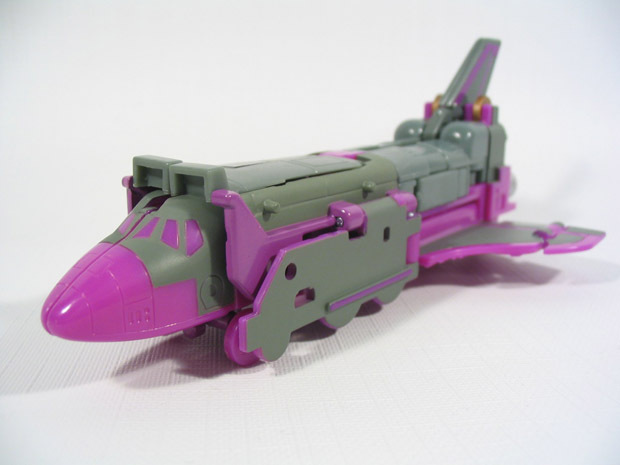 Whenever I see an Astrotrain toy (which admittedly isn’t often, despite my having worked in offices full of manchildren for the past nine years), I always experience a twinge of… well, not quite PTSD. Not quite survivor’s remorse. But something in that family. When I was in… fifth grade, I think? a friend brought in his Astrotrain and let me play with it during a break. At the time, the toy was new hotness and my mind exploded with the amazingness of a Transformer that could turn into three different things. It was rad! I messed around with the different forms for a few minutes and ultimately settled on the shuttle form. And then the girl I had a crush on saw me and looked horrified. She shook her head, tears in her eyes. “The space shuttle just exploded,” she explained. And our class spent most of the rest of the day watching newscasts about the Challenger disaster. People always say they’ll remember where they were when they heard that, say, President Kennedy was assassinated, or the Twin Towers were attacked. But I’m pretty sure most people weren’t playing with a little President Kennedy motorcade or a World Trade Center model at the time. That kind of thing really sticks with a guy, you know? Incidentally, the most shocking thing about that afternoon was how quickly the tasteless jokes spread. In an age before the Internet, cell phones, and perpetual interconnectivity to online communities dedicated entirely to propagating and wearing thin media-based memes within a matter of minutes, I have no idea how people were spreading popular jokes about the accident before the day was up. But any outrage that Astrotrain toy caused was nothing compared to when a classmate started cracking jokes about Christa McAuliffe. I guess poor taste exists beyond the bounds of mortal limits. This entry was posted in Toys and tagged transformers. Bookmark the permalink. It just makes me remember how gloriously whacked any sense of scale was in the Transformers movie, when they boarded Astrotrain…and, uh, the whole rest of the film too, I suppose. Also: Wasn’t the Autobot equivalent a bird with teeth or something? SkyLynx! Space shuttle with transport vehicle / “dino-bird” and lynx / griffon-like thing! I had him. He was awesome. Didn’t the Autobots also fly around in Cosmos or Cosmo or whatever, the teeny-tiny green UFO with the inexplicable Mexican accent? Ha! “Playing with a little President Kennedy motorcade.” You know there’s some kid out there who was. Hopefully GI Joe was not involved. When I was in fourth or fifth grade, the big event was Jessica McClure falling down a well. The school was in Odessa, so about 15 miles away from the incident. All we did in class was watch TV. I don’t remember the jokes, perhaps I blocked them out. No toy related wells that I know of. Oh man, I totally had that toy! One of its arms fell off in the gravel playground, never to be seen again.